Medellin is the second largest city in Colombia, and the capital of the Antioquia region which occupies a northern section of the country. Like most South American cities, it was founded in the 16th century by Spanish conquerors. It sits atop numerous lists of the best cities in South America. 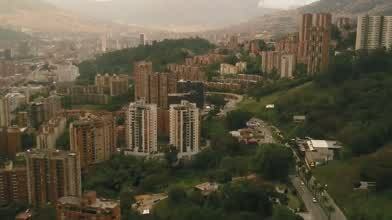 In this video, contributor Unraveled Studios was able to fly a drone over Medellin during the approach of a major thunderstorm over the surrounding mountains. Description: Each afternoon without fail, the thunderclouds roll over the mountains surrounding Medellin and make for the most spectacular sunsets. Was lucky enough to get ahead of the rain and wind to send the drone up for some shots of the city.